This is the exact outfit I wore on the plane over to London last week! Remember this pic I posted? I found this super soft striped dress at Urban Outfitters a week before I left, and found it to be the perfect piece to wear on my overnight flight. Right now this dress marked down to just under $40 – can you believe it?! I highly recommend it for any travel you have coming up – it doesn’t wrinkle, folds up really easily, and really is so comfortable. To make things even more simple, I brought along my basic black leather jacket and threw on my Converse sneakers – they are easy to slip off at security (if you don’t have TSA pre-check!) and are also very comfy. Just be sure to order a full size down. They run huge! Some other travel-friendly dresses I’ve found in recent weeks include this tie-waist dress by Joseph, this sweatshirt-style dress by AG, and this adorable ruffled t-shirt dress by CLU. All would be great options for your next journey! I’m in the process of looking for a new leather jacket and I love the style of this one. Beautiful, as always! Easy outfit! I love it! 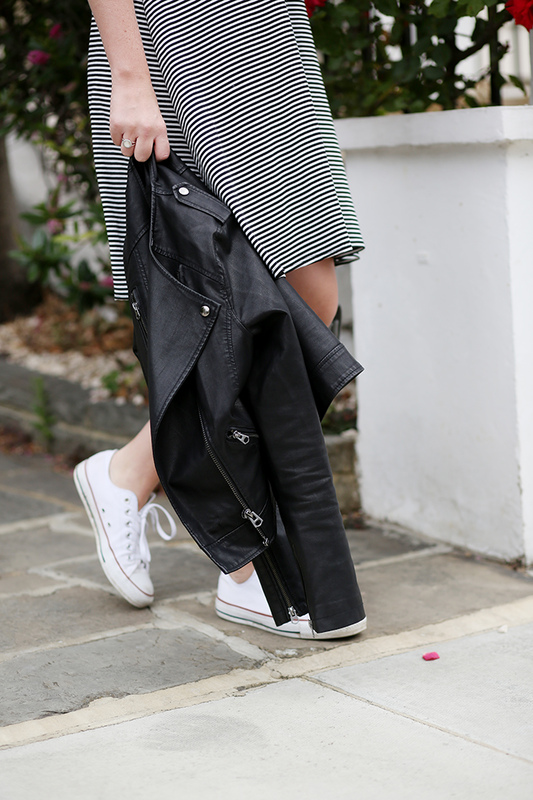 Love the casual stripes with the leather! I agree, looks like the perfect outfit for traveling and I always like to carry a jacket with me, even in summer, because the plane can get freezing! Love this comfy and chic look! I really need to invest in a pair of Converse. They’d be perfect for my lifestyle with four kids and our constant on the go schedule! Look this simple, but chic outfit! I’ve been loving all your London grams! Also, UO has the best striped tees and dresses!! 40 bucks?! I might need to make a little pit stop at Urban this week. Perf travel look! Everything looks better with a leather jacket. LOVE IT! You look great! Chic, yet comfy. My only question for you: do you get cold on the plane? Even with blankets and such, I find I get cold with exposed legs on long flights. Yes, I definitely get cold on planes! But with the wine I had and the thick blanket in business class, I was totally fine haha! hi loving this casual moto look on you! p.s hope you enjoyed my embarrassing snap! Love your swing dress! Perfect travel outfit. Love how comfy this looks, and always a fan of a great dress that doesnt wrinkle, or for a day anywhere — getting in and out of the car, and sitting, can create the worst wrinkles. Loving your pics from London! Love the outfit too!